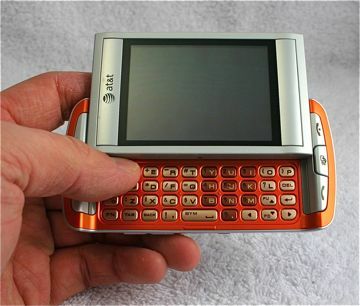 AT&T's Quickfire messaging device combines touch-screen fun with a full, physical QWERTY to make typing easier. Here is a report on its pros and cons. With video tour. Budget-minded messaging maniacs mark my words: The Quickfire from AT&T makes good on its promise of providing a good messaging experience, but it falls short in other areas. See if its weaknesses are enough to outweigh its strengths. I have noticed that the touchscreen of the quickfire seems to lag. I know that if I were using the phone I would be irritated when I pushed a menu option and had to wait for it to think about opening... For a touchscreen device, which will be compared to the iphone, if not only because At&t sells both of them the quickfire falls short. It also is a brick of a phone. The phone itself is weighty WITHOUT the battery in it!